The common way of discussing political views is as a single spectrum running from left to right. People identify themselves as one or the other or "centrist", and are pretty vague about what it all means. Some people have tried to make it a bit clearer with a two-dimensional model, but in doing so, they appropriate the terms left and right and redefine them according to their own notions of what's important. I think that's a mistake. Left and Right have useful meanings which are still applicable today. Leftism is the belief that government should break down social inequality. 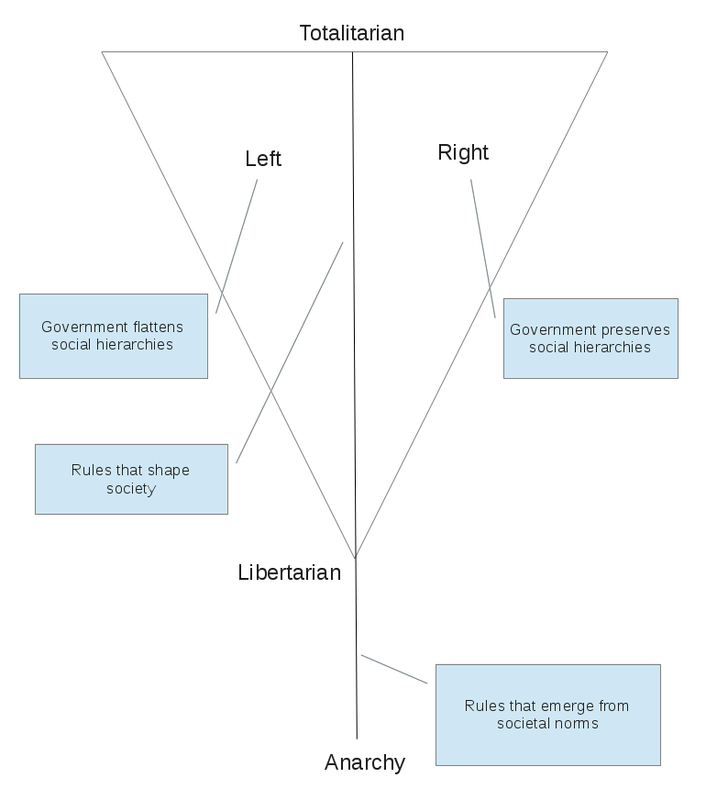 Rightism is the belief that government should preserve social hierarchies. So that's one dimension. If you believe that the government should do some of both, you're a "centrist". The second dimension is how much control the government should have in shaping society. The less control it has, the less far to the left or right it can be, so the shape of the spectrum is a triangle. At the top is totalitarianism, with right and left very far apart. And at the bottom? If you do away with all the laws that are aimed at either making things more equal or keeping society from changing, you still have some laws. They are the basic rules of settling differences that arise when people form a society. Libertarians believe that government should be limited to enforcing these laws, and that society should be free to structure itself in whatever ways work best. Then there's a little tail hanging off the bottom of the triangle. If you do away with even the basic laws of society, you arrive at anarchy, a system without government that somehow still runs in an orderly way. Which, incidentally, was what Karl Marx believed his extreme leftism would lead to. Those who advocate it tend to be smelly hippies, like Karl Marx. Science can't explain that. Have you see Arnold Kling's three-axis model? I had not seen that. It's a bit different. Rather than dividing issues into components, it is about which prism to view them through. So it's not really a multiple-axis model of political philosophy, but a how-to-frame-issues model.